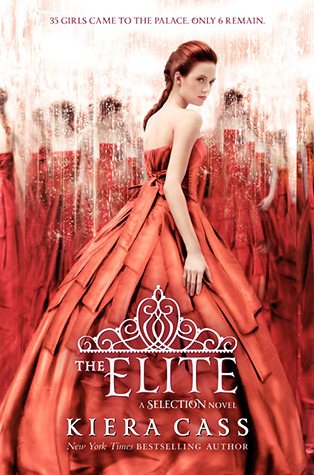 The Elite (The Selection #2) by Kiera Cass. April 2013. Harper Teen. Goodreads. Book 1: The Selection. Again I’m going to rave about these covers. I love every one in the series. They are perfectly gorgeous. My biggest complaint about this book was how wishy washy America was when deciding which guy she liked. It was super frustrating that I was dragged along with her drama. I didn’t like Aspen in book 1, but now I think he and Prince Maxon are both amazing. So I get the reasoning for her indecision since they are both great, but it’s still annoying. There’s more action in this book compared to the first. I liked the added suspense that kept the pages turning. I have very visual scenes that pop into my mind as I reflect on this read. There were some beautiful scenes that I would love to go back and read. If you enjoyed book 1 then you must read The Elite. It will pull you into a world of ball gowns and rebels.